Minister Regina Doherty clashed with Mick Wallace over the Public Services Card earlier this week. 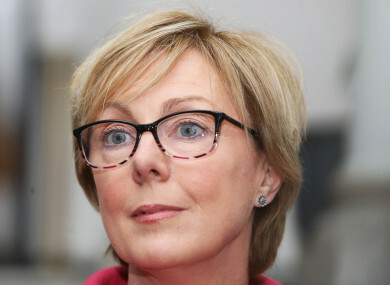 MINISTER FOR SOCIAL Protection Regina Doherty has said that her department will not be publishing a report on the Public Services Card (PSC), until it is given permission to do so by the Data Protection Commissioner (DPC). She told the Dáil this week she’d have the “legs cut off” her if she went against the “clear instructions” from the DPC not to release the report which examines whether the State’s identity card and related systems fully comply with Irish law. A Freedom of Information request submitted by the Irish Council for Civil Liberties for a copy of the report was earlier refused because it “may be contrary to public interest”. The PSC has been a consistent source of controversy for the government in recent years, with data protection concerns highlighted. Last week, TheJournal.ie reported that a woman was reduced to tears when asked for her adoption cert when applying for the card. It can be used to access a range of public services and people who apply for or receive social welfare payments are required to register for one. In 2018, it was announced that the card would be a mandatory requirement for those seeking a driver theory test – a stance that was later reversed. Independents4Change TD Mick Wallace asked Doherty questions about the PSC in the Dáil this week. He began by noting that the DPC had looked into a wide range of issues to do with the card, and asked the minister to commit to publishing the full and final report on the card irrespective of the outcome of the DPC’s investigation. Doherty replied that the DPC had provided a draft report on public services card in late August 2018. The minister said she was, as a result, in no position to provide an assurance that the draft report would be issued by her department at any stage, adding “I must do what I am told”. Wallace said that it was “amazing” that the Department of Social Protection’s response to the DPC’s report required such a “protracted, extended defence”. Doherty reiterated: “As I said to the Deputy, publication of the report is now entirely a matter for the Office of the Data Protection Commissioner, given that it has given us clear instructions that we are not to discuss or disclose the draft report. I would have the legs cut off me were I not to do what I have been asked to do by it, particularly in the light of the investigation and the sensitivity attached to it. The minister said that her department replied to the DPC in November, and is awaiting a response. No further update will be provided on this until the DPC reverts back to the Department of Social Protection. The issue of damage done to legs reappeared later in the debate, as Wallace pressed Doherty on the “optionality” of the card. Wallace pressed Doherty on whether anyone had had a social welfare payment denied to them if they refused to use a PSC. On two occasions, the minister said no. However, in a later written parliamentary question, Doherty advised that her department does not collect data on the number of individuals who currently – or at any point in time – were refused a payment because they hadn’t undergone the process required to get a PSC. Email “'I would have the legs cut off me': Doherty says she won't release PSC report until she's given go-ahead”. Feedback on “'I would have the legs cut off me': Doherty says she won't release PSC report until she's given go-ahead”.